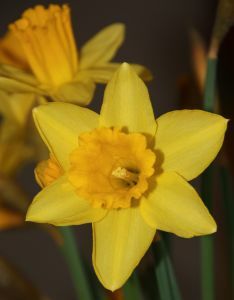 Pseudo Narcissus. This is known by all. It grows in woods, and double in gardens. The fresh root is to be used, which has great virtues. It acts as a gentle emetic, and purgative. It is the best to give in the juice with vine; but its principal uses are external. The fresh root, bruised and applied to wounds, soon heals them. It takes away the swelling and pain of sprains and bruises.